Thank you for your review. We really appreciate it. Have a great weekend. So far so good. I moved in last month and everyone has been very friendly to me. I wish the pool was open a little more consistently, but the 24-7 fitness center makes up for it and then some. We are glad that the gym is working out for you. Let us know how we can make it even better. If it weren't for the constant roaches, this place would be decent. Also, the location by the highway is convenient. I would not recommend living here to any one I know. Great! Super friendly team...they're the reason we hang around! Beautiful landscaping! Awesome pools! 24 hour fitness room! Close to everything! DVD rental on property! Animal friendly! Dog park area so you can run & play with your dogs! We love it, it's home! I love our third story apartment. It has amazing views and the breeze blows in the windows on cool days. The neighbors are always quiet so we never have a problem with noise. Everything is fine here. The only problems I say is the gate. I have spend more than once waiting outside for the gate to open. And the laundry mat they provide. The one in my building doesn't work. But I survived, I just went to another building. Good place to live on a budget. Close enough to downtown without having to live in the city. Negatives: bugs, and trying to get things fixed in the apartment is a bit of a hassle. And that front gate, that doesn't work, or the clicker doesn't work. Nob Hill is excited to have ya'll. I will make sure to put you on the list for call backs for the bugs. It's an older apartment complex. Maintenance has always been quick to make repairs! The office staff are very helpful and the pools are always clean. Thank you for your review. Please drop us a note anytime you have ideas for us on how to make this place great. Clean environment, friendly resident staff, community aware management staff! We even has our own security patrol which offers its service at night so I feel safe at home! We are pleased to hear good things about the guard. At first we didn't know if it was a good idea and now we know it is. I do think the office should improve their skills, especially with the paper work. The pools are great, especially the one at the office. The gate works from time to time when it should be closed. Overall, it has been an okay experience. We are glad to hear you like our pools. We did recently get a guard at the gate to ensure that its working properly. I'm so sorry about your refrigerator. I will make sure that we work on getting the problem fixed sooner and diagnosing it more accurately. I know it's an inconvenience but sometimes we do get crazy emergencies where we have to shut off off immediately so neighbors apts don't flood. If we do have something scheduled I will make sure that everyone get an email blast and a notice on their door. Have a good weekend. So far so good. I love when there is a problem they get right on it and get it fix. The grounds are well kept as well. The staff is friendly. for the most part I like living here. But, the gates are always an issue. The hallways are gross. The outside is maintained better then the inside. Hi ashley, We are excited that you enjoy living here. We did hire a security guard at the gate to better provide entry service if and when the gate isn't working properly. I will make sure that we work on keeping our breezeways looking better. Thank you. I have found a lovely Home with fantastic Management. I am knew but am so refreshed by their caring attitudes n sincerity !!! I am so excited !!! Thanks for your nice words. If there is anything we can do for your please let us know. I have friendly neighbors and the staff is accommodating and helpful. The on-site exercise room is a great part of the community. I am there almost every day. I also enjoyed the pool, during the summer. I do wish that there was better communication about repairs and issues. Thank you for your review. We appreciate you suggestion of better communication for online service requests. We are implementing procedures to better communicate with the resident when we receive online requests. Thanks again. Everyone is so friendly here. Maintanace is alwasy on point , the community is always so clean. I love the feel of coming into the community after being out in the busy city of Nashville. The landscaping is impeccable. I love calling this place home! Anytime we have an issue, you guys are always on top of it. Fast responses and very considerate. Very clean and beautiful property to live on. Staff is very very friendly and maintenance is great! Community is usually very clean and everyone keeps to themselves! The only thing I have to say is that the area isn't the greatest, but as long as you mind your own business, should be fine :) another thing is the kitchen is really small and there is little storage space. Just minor things like that. Thank you for your review. If there is anything we can me of assistance for you during your stay with us please let us know. I've only been here a few days but my experience so far has been great. Giovanna in the office was friendly and professional. She is amazing. The maintenance staff are also courteous and respectful. Thank you for your review and making Nob Hill your home. If there is anything we can help you with please let us know. I've only been here a few weeks but I can already tell you that I love living here. The staff is so helpful and accommodating and they make sure to stop what they're doing to help you when needed. The apartment itself is spacious but cozy and I have already made it feel like home. The complex is clean and has many amenities, including a dog park and two pools. I cannot wait for the summer to take advantage! 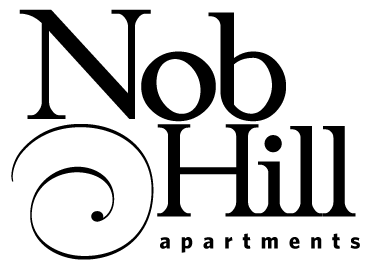 I have really enjoyed my experience working with Alma, and I am so impressed with the Nob Hill apartments. I can't wait to move into my new home. Great!!! i love the chance that the assistant manager gave us before moving in. We had numerous fails of trying to get a apartment, and he helped my husband & i out. Thanks for your review Jatoria! We're so glad you had such a great experience with Collin- he is really awesome isn't he? Please let us know if we can do anything else to make your time here any better!